After Mandy Mistletoe’s husband was fatally impaled on the horns of his favorite bull the townspeople started taking bets on how soon Coop would move from his bunk in the tack room to the main house. Cooper Trent had been foreman at the Wild River Ranch since close to forever, and everyone knew he’d never married because he adored Mandy, though never was this shown by word or deed. After the requisite few months of sincere mourning on both their parts, Coop and Mandy found it more and more difficult to ignore the obvious. The situation became complicated, however, when she took it into her head to get rid of the cattle (she’d never forgiven that bull) and turn the Wild River into a goat ranch. She’d always loved the mischievous critters, and knew she could do well by renting out a herd to clear brush from neighboring spreads. He drove to town and spent the next week living at the Sagebrush Inn and drinking at The Lost Cause. He missed Mandy, but he wasn’t going to haul goats to work sites and babysit them. Finally Mandy resolved the issue by firing her foreman and rehiring him as her husband. They found an experienced goat herder and let him set up camp in the tack room and take over critter duties. Coop and Mandy got interested in farming, and developed a big apple orchard on some nice bottomland. The townspeople went back to gossiping about Sheriff Baxter’s love life. 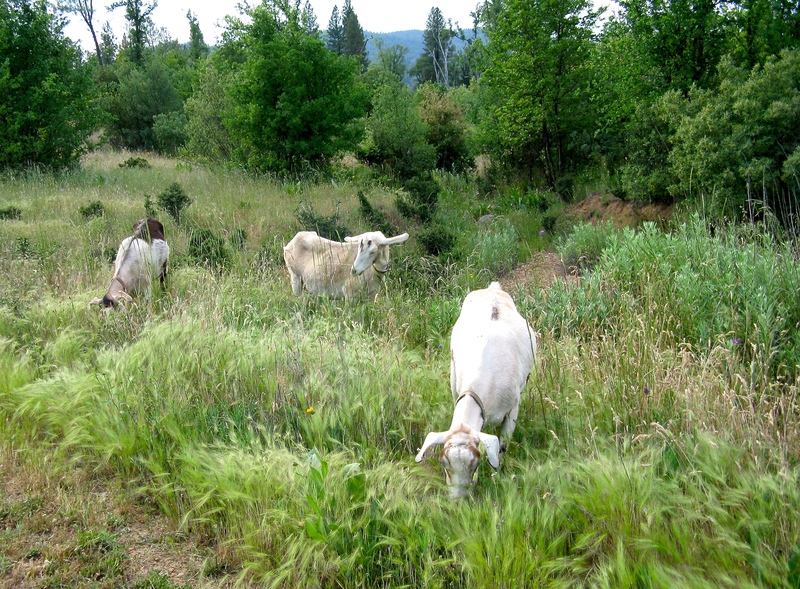 And Mandy’s brush-clearing crew went to work under the watchful eye of their hired herder. Tags: goats. Bookmark the permalink.